The configuration for this scenario includes a virtual private cloud (VPC) with a public subnet and a private subnet. We recommend this scenario if you want to run a public-facing web application, while maintaining back-end servers that aren't publicly accessible. A common example is a multi-tier website, with the web servers in a public subnet and the database servers in a private subnet. You can set up security and routing so that the web servers can communicate with the database servers. The instances in the public subnet can send outbound traffic directly to the Internet, whereas the instances in the private subnet can't. Instead, the instances in the private subnet can access the Internet by using a network address translation (NAT) gateway that resides in the public subnet. The database servers can connect to the Internet for software updates using the NAT gateway, but the Internet cannot establish connections to the database servers. You can also use the VPC wizard to configure a VPC with a NAT instance; however, we recommend that you use a NAT gateway. For more information, see NAT Gateways. This scenario can also be optionally configured for IPv6—you can use the VPC wizard to create a VPC and subnets with associated IPv6 CIDR blocks. Instances launched into the subnets can receive IPv6 addresses, and communicate using IPv6. Instances in the private subnet can use an egress-only Internet gateway to connect to the Internet over IPv6, but the Internet cannot establish connections to the private instances over IPv6. For more information about IPv4 and IPv6 addressing, see IP Addressing in Your VPC. The following diagram shows the key components of the configuration for this scenario. A VPC with a size /16 IPv4 CIDR block (example: 10.0.0.0/16). This provides 65,536 private IPv4 addresses. A public subnet with a size /24 IPv4 CIDR block (example: 10.0.0.0/24). This provides 256 private IPv4 addresses. A public subnet is a subnet that's associated with a route table that has a route to an Internet gateway. A private subnet with a size /24 IPv4 CIDR block (example: 10.0.1.0/24). This provides 256 private IPv4 addresses. An Internet gateway. This connects the VPC to the Internet and to other AWS services. Instances with private IPv4 addresses in the subnet range (examples: 10.0.0.5, 10.0.1.5). This enables them to communicate with each other and other instances in the VPC. Instances in the public subnet with Elastic IPv4 addresses (example: 198.51.100.1), which are public IPv4 addresses that enable them to be reached from the Internet. The instances can have public IP addresses assigned at launch instead of Elastic IP addresses. Instances in the private subnet are back-end servers that don't need to accept incoming traffic from the Internet and therefore do not have public IP addresses; however, they can send requests to the Internet using the NAT gateway (see the next bullet). A NAT gateway with its own Elastic IPv4 address. Instances in the private subnet can send requests to the Internet through the NAT gateway over IPv4 (for example, for software updates). A custom route table associated with the public subnet. This route table contains an entry that enables instances in the subnet to communicate with other instances in the VPC over IPv4, and an entry that enables instances in the subnet to communicate directly with the Internet over IPv4. The main route table associated with the private subnet. The route table contains an entry that enables instances in the subnet to communicate with other instances in the VPC over IPv4, and an entry that enables instances in the subnet to communicate with the Internet through the NAT gateway over IPv4. For more information about subnets, see VPCs and Subnets. For more information about Internet gateways, see Internet Gateways. For more information about NAT gateways, see NAT Gateways. A size /56 IPv6 CIDR block associated with the VPC (example: 2001:db8:1234:1a00::/56). Amazon automatically assigns the CIDR; you cannot choose the range yourself. A size /64 IPv6 CIDR block associated with the public subnet (example: 2001:db8:1234:1a00::/64). You can choose the range for your subnet from the range allocated to the VPC. You cannot choose the size of the VPC IPv6 CIDR block. A size /64 IPv6 CIDR block associated with the private subnet (example: 2001:db8:1234:1a01::/64). You can choose the range for your subnet from the range allocated to the VPC. You cannot choose the size of the subnet IPv6 CIDR block. IPv6 addresses assigned to the instances from the subnet range (example: 2001:db8:1234:1a00::1a). An egress-only Internet gateway. This enables instances in the private subnet to send requests to the Internet over IPv6 (for example, for software updates). An egress-only Internet gateway is necessary if you want instances in the private subnet to be able to initiate communication with the Internet over IPv6. For more information, see Egress-Only Internet Gateways. Route table entries in the custom route table that enable instances in the public subnet to use IPv6 to communicate with each other, and directly over the Internet. Route table entries in the main route table that enable instances in the private subnet to use IPv6 to communicate with each other, and to communicate with the Internet through an egress-only Internet gateway. In this scenario, the VPC wizard updates the main route table used with the private subnet, and creates a custom route table and associates it with the public subnet. In this scenario, all traffic from each subnet that is bound for AWS (for example, to the Amazon EC2 or Amazon S3 endpoints) goes over the Internet gateway. The database servers in the private subnet can't receive traffic from the Internet directly because they don't have Elastic IP addresses. However, the database servers can send and receive Internet traffic through the NAT device in the public subnet. Any additional subnets that you create use the main route table by default, which means that they are private subnets by default. If you want to make a subnet public, you can always change the route table that it's associated with. The following tables describe the route tables for this scenario. 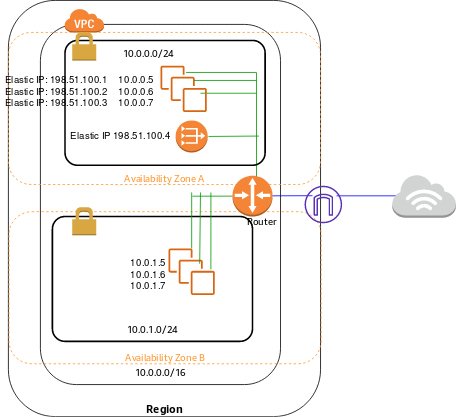 The first entry is the default entry for local routing in the VPC; this entry enables the instances in the VPC to communicate with each other. The second entry sends all other subnet traffic to the NAT gateway (for example, nat-12345678901234567). The first entry is the default entry for local routing in the VPC; this entry enables the instances in this VPC to communicate with each other. The second entry routes all other subnet traffic to the Internet over the Internet gateway (for example, igw-1a2b3d4d). If you associate an IPv6 CIDR block with your VPC and subnets, your route tables must include separate routes for IPv6 traffic. The following tables show the route tables for this scenario if you choose to enable IPv6 communication in your VPC. The second entry is the default route that's automatically added for local routing in the VPC over IPv6. The fourth entry routes all other IPv6 subnet traffic to the egress-only Internet gateway. The second entry is the default route that's automatically added for local routing in the VPC over IPv6. The fourth entry routes all other IPv6 subnet traffic to the Internet gateway. AWS provides two features that you can use to increase security in your VPC: security groups and network ACLs. Security groups control inbound and outbound traffic for your instances, and network ACLs control inbound and outbound traffic for your subnets. In most cases, security groups can meet your needs; however, you can also use network ACLs if you want an additional layer of security for your VPC. For more information, see Security. For scenario 2, you'll use security groups but not network ACLs. If you'd like to use a network ACL, see Recommended Rules for Scenario 2. WebServerSG: Specify this security group when you launch the web servers in the public subnet. DBServerSG: Specify this security group when you launch the database servers in the private subnet. The instances assigned to a security group can be in different subnets. However, in this scenario, each security group corresponds to the type of role an instance plays, and each role requires the instance to be in a particular subnet. Therefore, in this scenario, all instances assigned to a security group are in the same subnet. The following table describes the recommended rules for the WebServerSG security group, which allow the web servers to receive Internet traffic, as well as SSH and RDP traffic from your network. The web servers can also initiate read and write requests to the database servers in the private subnet, and send traffic to the Internet; for example, to get software updates. Because the web server doesn't initiate any other outbound communication, the default outbound rule is removed. These recommendations include both SSH and RDP access, and both Microsoft SQL Server and MySQL access. For your situation, you might only need rules for Linux (SSH and MySQL) or Windows (RDP and Microsoft SQL Server). Allow inbound HTTP access to the web servers from any IPv4 address. Allow inbound HTTPS access to the web servers from any IPv4 address. Allow inbound SSH access to Linux instances from your home network (over the Internet gateway). You can get the public IPv4 address of your local computer using a service such as http://checkip.amazonaws.com or https://checkip.amazonaws.com. If you are connecting through an ISP or from behind your firewall without a static IP address, you need to find out the range of IP addresses used by client computers. Allow inbound RDP access to Windows instances from your home network (over the Internet gateway). Allow outbound Microsoft SQL Server access to the database servers assigned to the DBServerSG security group. Allow outbound MySQL access to the database servers assigned to the DBServerSG security group. Allow outbound HTTP access to any IPv4 address. Allow outbound HTTPS access to any IPv4 address. The following table describes the recommended rules for the DBServerSG security group, which allow read or write database requests from the web servers. The database servers can also initiate traffic bound for the Internet (the route table sends that traffic to the NAT gateway, which then forwards it to the Internet over the Internet gateway). Allow inbound Microsoft SQL Server access from the web servers associated with the WebServerSG security group. Allow inbound MySQL Server access from the web servers associated with the WebServerSG security group. Allow outbound HTTP access to the Internet over IPv4 (for example, for software updates). Allow outbound HTTPS access to the Internet over IPv4 (for example, for software updates). Allow inbound traffic from other instances assigned to this security group. The ID of the security group All All Allow outbound traffic to other instances assigned to this security group. (Optional) If you launch a bastion host in your public subnet to use as a proxy for SSH or RDP traffic from your home network to your private subnet, add a rule to the DBServerSG security group that allows inbound SSH or RDP traffic from the bastion instance or its associated security group. If you associate an IPv6 CIDR block with your VPC and subnets, you must add separate rules to your WebServerSG and DBServerSG security groups to control inbound and outbound IPv6 traffic for your instances. In this scenario, the web servers will be able to receive all Internet traffic over IPv6, and SSH or RDP traffic from your local network over IPv6. They can also initiate outbound IPv6 traffic to the Internet. The database servers can initiate outbound IPv6 traffic to the Internet. The following are the IPv6-specific rules for the WebServerSG security group (which are in addition to the rules listed above). Allow inbound HTTP access to the web servers from any IPv6 address. Allow inbound HTTPS access to the web servers from any IPv6 address. (Linux instances) Allow inbound SSH access over IPv6 from your network. ::/0 TCP HTTP Allow outbound HTTP access to any IPv6 address. ::/0 TCP HTTPS Allow outbound HTTPS access to any IPv6 address. The following are the IPv6-specific rules for the DBServerSG security group (which are in addition to the rules listed above). Allow outbound HTTP access to any IPv6 address. Allow outbound HTTPS access to any IPv6 address. You can use the VPC wizard to create the VPC, subnets, NAT gateway, and optionally, an egress-only Internet gateway. You must specify an Elastic IP address for your NAT gateway; if you don't have one, you must first allocate one to your account. If you want to use an existing Elastic IP address, ensure that it's not currently associated with another instance or network interface. The NAT gateway is automatically created in the public subnet of your VPC. These procedures include optional steps for enabling and configuring IPv6 communication for your VPC. You do not have to perform these steps if you do not want to use IPv6 in your VPC. If your account supports EC2-Classic, first choose VPC. Choose the second option, VPC with Public and Private Subnets, and then choose Select. (Optional) You can name your VPC and subnets to help you identify them later in the console. You can specify your own IPv4 CIDR block range for the VPC and subnets, or you can keep the default values. (Optional, IPv6-only) For IPv6 CIDR block, choose Amazon-provided IPv6 CIDR block. For Public subnet's IPv6 CIDR, choose Specify a custom IPv6 CIDR and specify the hexadecimal pair value for your subnet, or keep the default value. For Private subnet's IPv6 CIDR, choose Specify a custom IPv6 CIDR. Specify the hexadecimal pair value for the IPv6 subnet or keep the default value. In the Specify the details of your NAT gateway section, specify the allocation ID for an Elastic IP address in your account. You can keep the rest of the default values on the page, and choose Create VPC. Because the WebServerSG and DBServerSG security groups reference each other, create all the security groups required for this scenario before you add rules to them. Provide a name and description for the security group. In this topic, the name WebServerSG is used as an example. For VPC, select the ID of the VPC you created and choose Yes, Create. Choose Create Security Group again. Provide a name and description for the security group. In this topic, the name DBServerSG is used as an example. For VPC, select the ID of your VPC and choose Yes, Create. Select the WebServerSG security group that you created. The details pane displays the details for the security group, plus tabs for working with its inbound and outbound rules. Choose Type, HTTP. For Source, enter 0.0.0.0/0. Choose Add another rule, Type, HTTPS. For Source, enter 0.0.0.0/0. Choose Add another rule, Type, SSH. For Source, enter your network's public IPv4 address range. Choose Add another rule, Type, RDP. For Source, enter your network's public IPv4 address range. (Optional, IPv6-only) Choose Add another rule, Type, HTTP. For Source, enter ::/0. (Optional, IPv6-only) Choose Add another rule, Type, HTTPS. For Source, enter ::/0. (Optional, IPv6-only) Choose Add another rule, Type, SSH (for Linux) or RDP (for Windows). For Source, enter your network's IPv6 address range. Locate the default rule that enables all outbound traffic and choose Remove. Choose Type, MS SQL. For Destination, specify the ID of the DBServerSG security group. Choose Add another rule, Type, MySQL. For Destination, specify the ID of the DBServerSG security group. Choose Add another rule, Type, HTTPS. For Destination, enter 0.0.0.0/0. Choose Add another rule, Type, HTTP. For Destination, enter 0.0.0.0/0. (Optional, IPv6-only) Choose Add another rule, Type, HTTPS. For Destination, enter ::/0. (Optional, IPv6-only) Choose Add another rule, Type, HTTP. For Destination, enter ::/0. Select the DBServerSG security group that you created. The details pane displays the details for the security group, plus tabs for working with its inbound and outbound rules. Choose Type, MS SQL. For Source, specify the ID of your WebServerSG security group. Choose Add another rule, Type, MYSQL. For Source, specify the ID of your WebServerSG security group. Choose Type, HTTP. For Destination, enter 0.0.0.0/0. You can now launch instances into your VPC. From the dashboard, choose Launch Instance. Select an AMI and an instance type and choose Next: Configure Instance Details. If you intend to use your instance for IPv6 communication, you must choose a supported instance type; for example, T2. For more information, see Amazon EC2 Instance Types. On the Configure Instance Details page, for Network, select the VPC that you created earlier and then select a subnet. For example, launch a web server into the public subnet and the database server into the private subnet. (Optional) By default, instances launched into a nondefault VPC are not assigned a public IPv4 address. To be able to connect to your instance in the public subnet, you can assign a public IPv4 address now, or allocate an Elastic IP address and assign it to your instance after it's launched. To assign a public IPv4 address now, ensure that you choose Enable from the Auto-assign Public IP list. You do not need to assign a public IP address to an instance in the private subnet. You can only use the auto-assign public IPv4 feature for a single, new network interface with the device index of eth0. For more information, see Assigning a Public IPv4 Address During Instance Launch. (Optional, IPv6-only) You can auto-assign an IPv6 address to your instance from the subnet range. For Auto-assign IPv6 IP, choose Enable. On the next two pages of the wizard, you can configure storage for your instance, and add tags. On the Configure Security Group page, choose the Select an existing security group option, and select one of the security groups you created earlier (WebServerSG for a web server or DBServerSG for a database server). Choose Review and Launch. Review the settings that you've chosen. Make any changes that you need and choose Launch to choose a key pair and launch your instance. If you did not assign a public IPv4 address to your instance in the public subnet in step 5, you will not be able to connect to it. Before you can access an instance in your public subnet, you must assign it an Elastic IP address. Select the Elastic IP address from the list and choose Actions, Associate address. Select the network interface or instance. For Private IP, select the corresponding address to associate the Elastic IP address with and choose Associate. You can now connect to your instances in the VPC. For information about how to connect to a Linux instance, see Connect to Your Linux Instance in the Amazon EC2 User Guide for Linux Instances. For information about how to connect to a Windows instance, see Connect to Your Windows Instance in the Amazon EC2 User Guide for Windows Instances. You can implement scenario 2 using a NAT instance instead of a NAT gateway. For more information about NAT instances, see NAT Instances. You can follow the same procedures as above; however, in the NAT section of the VPC wizard, choose Use a NAT instance instead and specify the details for your NAT instance. You will also require a security group for your NAT instance (NATSG), which allows the NAT instance to receive Internet-bound traffic from instances in the private subnet, as well as SSH traffic from your network. The NAT instance can also send traffic to the Internet, so that instances in the private subnet can get software updates. After you've created the VPC with the NAT instance, you must change the security group associated with the NAT instance to the new NATSG security group (by default, the NAT instance is launched using the default security group). In the navigation pane, choose Security Groups, and the choose Create Security Group. Specify a name and description for the security group. In this topic, the name NATSG is used as an example. For VPC, select the ID of your VPC and choose Yes, Create. Select the NATSG security group that you created. The details pane displays the details for the security group, plus tabs for working with its inbound and outbound rules. Choose Type, HTTP . For Source, enter the IP address range of your private subnet. Choose Add another rule, Type, HTTPS. For Source, enter the IP address range of your private subnet. Choose Add another rule, Type, SSH. For Source, enter your network's public IP address range. When the VPC wizard launched the NAT instance, it used the default security group for the VPC. You need to associate the NAT instance with the NATSG security group instead. Select the network interface for the NAT instance from the list and choose Actions, Change Security Groups. In the Change Security Groups dialog box, for Security groups, select the NATSG security group that you created (see Security) and choose Save.